Beginning July 2, 2011 Kreinik will be closing its offices and manufacturing plant for a little summer rest and relaxation. 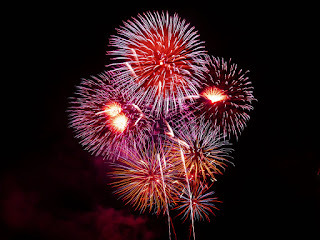 We will re-open on July 11, 2011. 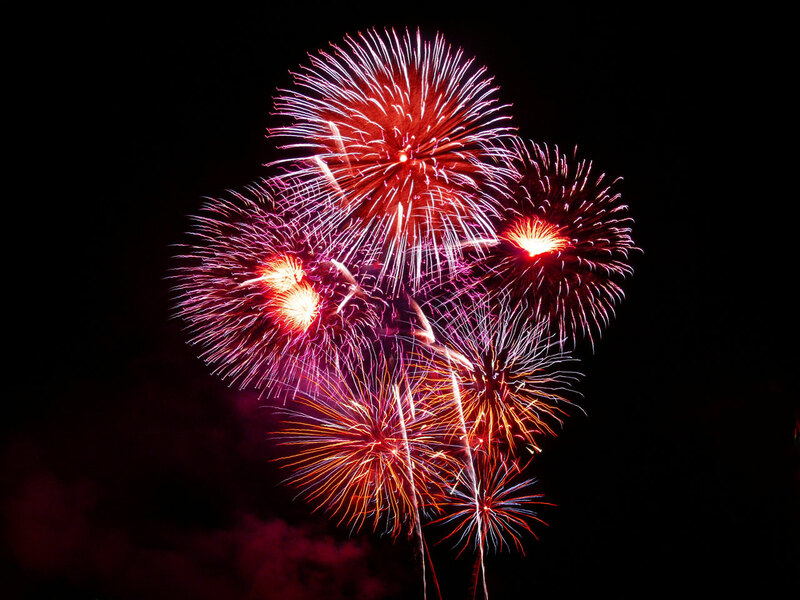 Here's a couple of Doug Kreinik's favorite recipes to try during your 4th of July holiday. I do not eat milk products anymore, but my kids, and they are grown, love this when they visit. They now even make it in their homes. I begin with a basic white sauce using a double boiler. Bring to a slow boil and continue to boil constantly stirring. This creamy white sauce should be thick and smooth. I love to experiment. I had heard that you could take any citrus and make a pie. I use premade pie crusts. Beat egg whites and cream of tartar until frothy. Beat in sugar, 1 tbsp at a time until stiff and glossy. Mix sugar and cornstarch and gradually stir in water. Cook over medium heat, stir constantly until it thickens and boils for 1 min. Gradually stir in half of the hot mixture into egg yolks. Cover the pie with heaps of meringue making sure to carefully seal the edges. Bake at 400 degrees for about 10 minutes or until a light brown then cool. With my dad’s passing, my mom has decided to look through her massive stashes of “stuff” and give things away. 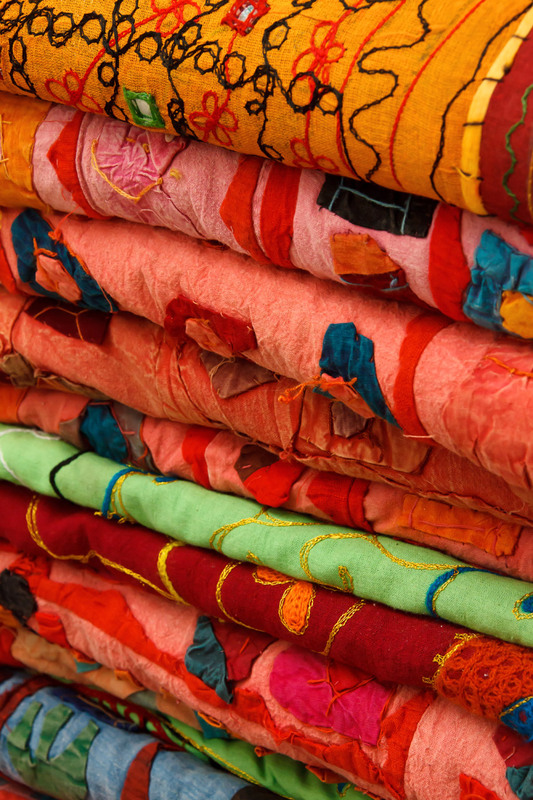 With a career in textiles, you can imagine the treasure trove she has collected. She used to teach clothing and couturier design at different universities, for example, so over the years she has purchased many different types of fabrics and trims. Recently, I attended a meeting at the fashion school at West Virginia University. One of the professors mentioned that the students often have difficulty creating their projects due to the cost of fabrics. That comment sparked an idea, so I went home and told my mom about the conversation. 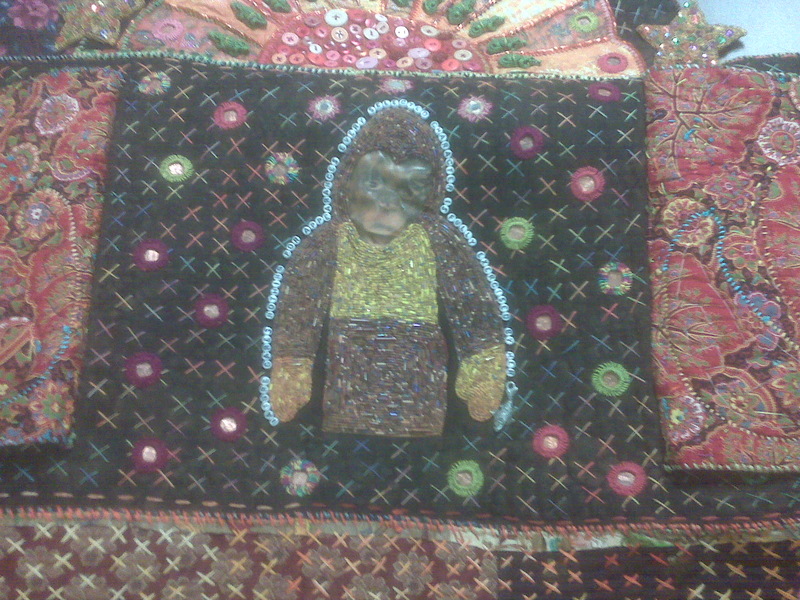 We both agreed that mom’s textile treasures could find a new home with the university. Here was a win-win situation where my mom could give her stash of 70 years of wools, velvets, and even the first thermal fabrics developed by the Navy in the 1950s plus her collection of Vogue patterns to a place where they would be loved, treasured and used. So we set up a meeting for the dean of the school to visit my mom and see her collection. After a lot of oohs and ahs, we filled up the van with bolts and pieces of fabric, a large box of patterns which would go into the school’s pattern library, and original issues of American Fabric Magazine which contain actual fabric swatches. My mom felt great about this project. It was a big move for her to take, but felt that instead of fabric just being placed in a plastic bag and given away to a charity, this meant that students would be able to benefit from the wealth of information that she could still offer young people. An additional outcome was that the dean asked my mom if she would consider visiting the campus and having a conversation with the students on her history working in the textile industry during the 20th century. She is considering the idea. If you have a family member who has a fabric, trim, or textile stash, or you have a stash that you are no longer using, think about universities or school programs that could use these items to help build skills for our children and young people, helping them grow into the future. Kreinik will be there as one of the vendors you can shop with! Look for Kreinik along with the Sewing Bee in booth #C-4,5 to shop for Kreinik threads. 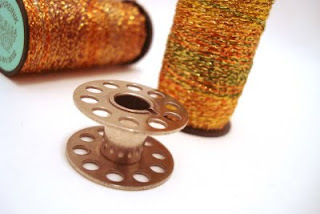 Click here to see our new video using Kreinik Ombre Metallic™ in the Bobbin. This organization continues the recording of the tradition, culture, and history of quiltmaking in West Virginia that began with the West Virginia Heritage Quilt Search, Inc. and will encourage the care and preservation of quilts, both old and new. “Something for everyone” is the phrase to describe the two new exhibitions opening Friday, June 10, from 5:30 to 7:30 at the Parkersburg Art Center. The works in both exhibits are by members of the Innovative Arts Alliance, a group of artists from Ohio and West Virginia. It is a “creative convergence,” with sculptures, drawings, paintings, carvings and textile arts in all forms on display. “We are really thrilled to be welcoming back members of the IA,” says Abby Hayhurst, Art Center director. “Their exhibit in 2009 was one of our most popular shows, because of both the broad variety of works, and also the great skill level of the various artists.” Alliance members include Vern Allen and Ele Rumen-Allen of Amanda, Ohio; June Baker of Ellenboro, WV, Lynda Berman and Lanna Galloway of Athens, Ohio; Susan Nash and Susan Stubbins of Zanesville, Ohio; Thaddeus Brejwo of Whipple, Anna Prince of Marietta, Ohio; and Andi Stern of Chauncey, Ohio. The exhibit will in the Art Center’s Main, South, and Whitlatch galleries. Opening at the same time, in the Esbenshade Gallery, will be works by Thaddeus Brejwo, a member of the Innovative Arts Alliance. “Thaddeus is a colorful guy, who is at home in many different mediums. He paints, he sculpts, he can do it all, including designing for the stage,” says Hayhurst. The opening reception is open to the public, with an admission charge of $10 per person. There is no charge for Art Center members. The exhibit is open for viewing Wednesday through Saturday from 10:00 a.m. to 5:00 p.m. through July 16. Daily admission to the Art Center is $2 for adults, with no charge for children under age 12. Being in the textile business and the craft business, textile art is one of my all-time favorites. Every few years, the Parkersburg Art Center has a supurb collection of work created by the Innovative Arts Alliance , a group of artists from West Virginia and Ohio. I was able to get a sneak preview of much of the exhibit when the director Abby Hayhurst called me and said, “Doug , you have to get over here right away.” To quote my son: “Awesome.” What a great collection of quilts, embroidery and other forms of textile arts and sculpture. I would really recommend the drive or visit, whether you are coming through Parkersburg or making a day trip. 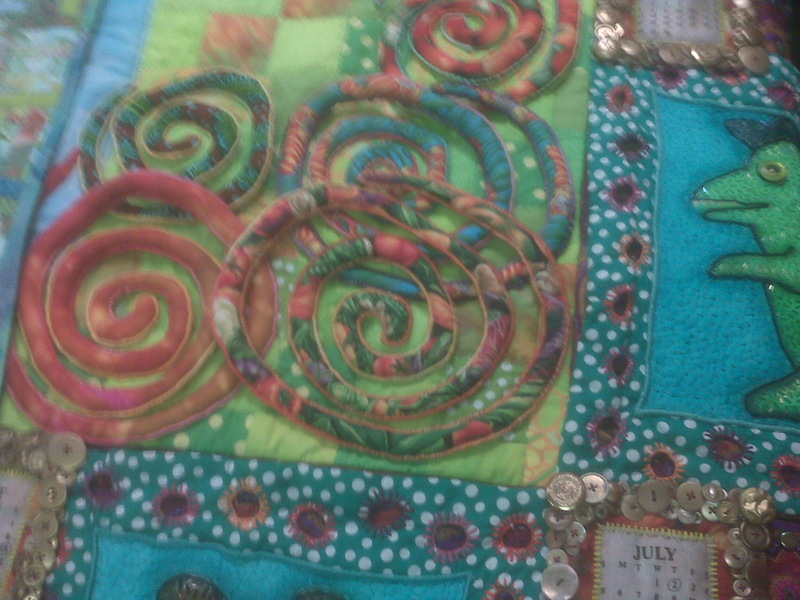 One of the artisans, Andi Stern of Chauncey, Ohio has three pieces on exhibit: Octopus' Garden, Boogie Shoes and Twelve Step, using Kreinik braids and sewing threads. This is a very exciting set of work. The pieces are stunning and we are so excited to be represented in such a way. For more information on her textile art, her blog is http://andreasternart.blogspot.com. As Kreinik prepares for the TNNA needlework trade show next week, we are looking forward to seeing wonderful needlepoint, counted thread, knit and crochet designs at market. Stay tuned for new product updates from Kreinik, as well as Facebook and Twitter feeds from the show. One of our new product lines consists of crochet bookmark designs. Do you crochet? Whether you have picked up a hook and chained an afghan, scarf, sock, jewelry or accessory of your own, or even if you haven't, try to catch the Hyperbolic Crochet Coral Reef exhibit that is currently traveling the world. I was able to see it earlier this year at the Smithsonian Museum in Washington DC, and it was simply stunning. According to the web site http://crochetcoralreef.org, the Hyperbolic Crochet Coral Reef is a "woolly celebration of the intersection of higher geometry and feminine handicraft, and a testimony to the disappearing wonders of the marine world." It began in 2005 as a project by Australian sisters Christine and Margaret Wertheim, who were actually living in Los Angeles at the time. It was an homage to the disappearing Great Barrier Reef, but today it has expanded to become so much more. The current exhibit includes displays of the Great Barrier Reef plus "sub-reefs" such as a bleached reef, anemone garden, kelp garden, plus dramatic renditions of a toxic reef complete with trash worked into the yarn. The latter is a sad reminder of how our natural wonders are treated. With this unique perspective on coral reefs, you leave the exhibit awed by beauty and determined to pick up trash as you go along in this world. So many artists have worked on the reef exhibit at this point. Kreinik is excited to have worked with some of them, including Shirley Waxman, Arlene Mintzer, Barbara Van Elsen and Lily Chin. I am pretty sure I saw some sparkling Kreinik threads woven into the reefs. You can use any Kreinik thread as a carry-along fiber in crochet, and some sizes are perfect for crochet on their own. At the reef exhibit in Washington DC, I loved hearing visitors' remarks (including non-crocheters seeing this age-old "woman's" art form used in such a scientific way). Teenagers loved the crochet, kids loved the colors and shapes, most thought it was a real reef until they walked up to it ("That's crochet?!"). The exhibit arrives at the Art Center College of Design in Pasadena, California later this month. Check it out if you are in the area. Visit http://crochetcoralreef.org for more information.